The vertebrate retina is inverted with respect to its optical function. Here, the photoreceptor cells are turned away from the light source and light has to pass through a significant thickness of tissue layers before being detected. These retinal layers contain numerous objects which differ in shape and refractive index, which should lead to scattering, refraction and reflection of the light on its way to the photoreceptors, thus decreasing image quality (Fig. 1). Fig. 1: The inverted structure of the vertebrate retina. Light is coming from above and has to travel through several layers of light scattering tissue before reaching the sensitive photoreceptor cells at the back-side of the retina. The different retinal nuclear and plexiform layers are indicated in this schematic. The bright structures spanning the entire retinal thickness represent Müller cells, whose endfeet completely cover the inner retinal surface. Nature itself provides evidence for the disturbing effect of these inner retinal layers. In the fovea centralis, the highly specialized retinal area of sharp central vision in humans and primates, the photoreceptor cells are not obscured by any inner retinal layers at all. However, even if most mammals don’t have a fovea, many species possess an impressively good vision. To address this apparent discrepancy, scientists of the Graduate College ‘Interneuro’ of the University of Leipzig under Andreas Reichenbach and Jochen Guck have studied the light transport through the inner retinal layers. 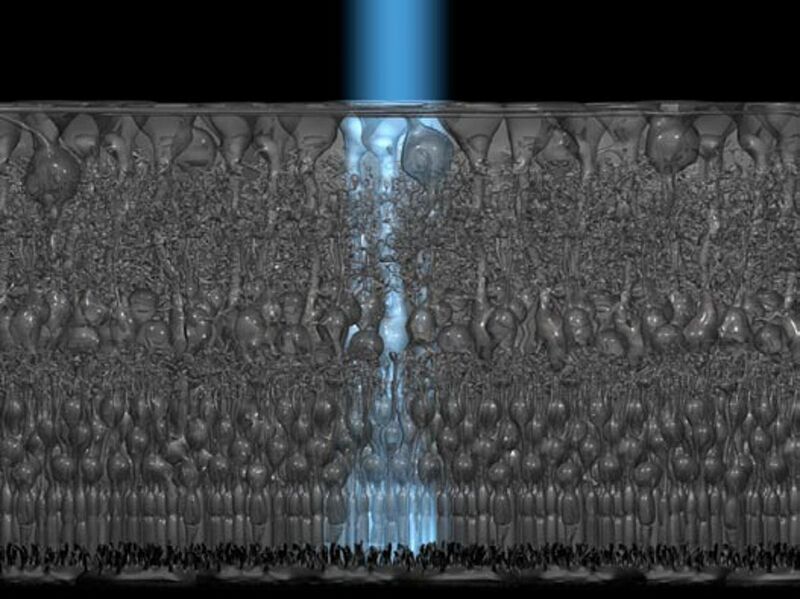 Using a modified confocal laser scanning microscopy (CLSM) technique, they first found that light arrives at the level of the photoreceptor cells inhomogeneously distributed. Bright spots, which corresponded to places of high transmission, were surrounded by darker areas. Exploiting a CLSM in reflection mode, they found that also reflection within the retinal tissue was highly inhomogeneous. The dark areas of low transmittance observed in the first experiment reflected significantly more light than the bright spots through which initially more light was transmitted. Particularly both plexiform layers and the nerve fiber layer showed a high degree of back-scattering. Interestingly, the low-reflecting and highly transmitting areas were contiguous in adjacent horizontal optical sections and therefore formed tubes that spanned the entire retinal thickness. Diameters of these tubes and spacing between them were very similar to those of the columnar Müller cells. Using immunocytochemistry they identified these structures, which obviously relayed light better than their surrounding, as Müller glial cells. Müller cells constitute the dominant glial cell type in the retina. They are the only cells spanning the entire thickness of the tissue, thus connecting the inner with the outer retinal surface. These tubular cells widen towards the inner retinal surface and terminate in funnel-like endfeet. These endfeet cover the entire retinal surface, so that every photon that enters the eye automatically hits a Müller cell. These observations suggested that Müller cells could be light guiding structures. Classical optical fibers are characterized by a cylindrical shape and a high refractive index of their light guiding core. The scientists therefore investigated the refractive indices of retinal cells using quantitative phase microscopy. Thereby, Müller cells possessed a significantly higher refractive index than all other retinal cell types. The only exception was the Müller cell endfoot, where the refractive index decreased towards the inner retinal surface. Therefore, all requirements that would Müller cells theoretically allow to act as optical fibers were fulfilled. To test this hypothesis, a new method was developed that allowed the investigation of light transmission through individual cells. Using a modified dual-beam infrared laser trap, individual cells were held between the ends of two optical fibers and visible light was sent through them, thus directly testing their axial light transmission. These experiments showed that Müller cells efficiently guide light comparable to optical fibers from one end to the other, or in other words from the inner retinal surface to the photoreceptors. Artificial optical equipment, which similar to the retina consists of thousands of light guides that are arranged in parallel to each other and perpendicular to the surface, has been developed by man. The purpose of these so-called fiber optic plates (FOPs) is the image transfer from one surface of the plate to the other with minimal loss and distortion. When the scientists compared retinae with FOPs they found that both structures shifted the focal plane from one surface to the other; retinae thus behaved optically similar to FOPs. Even more, while in an FOP the light guiding structures possess cylindrical shape and a constant refractive index, the funnel-shape of Müller cells and their refractive index gradient provide an optimal optical coupling of the retina to the vitreous (Fig. 2). Fig. 2: Comparison of a retina with a fiber-optic plate (FOP). Upper part: both structures share the same basic design: they are composed of optical fibers that are ordered in parallel to each other and perpendicular to the surface. Lower part: these optical fibers are responsible for the image transfer through the respective structure. Left: microscopic image of a letter on a microfiche (height ~100 µm). Middle: the same letter imaged through an FOP; and right: image transfer through a retina. In both structures, images are transmitted from one surface to the other with minimal loss and distortion along optical fibers. 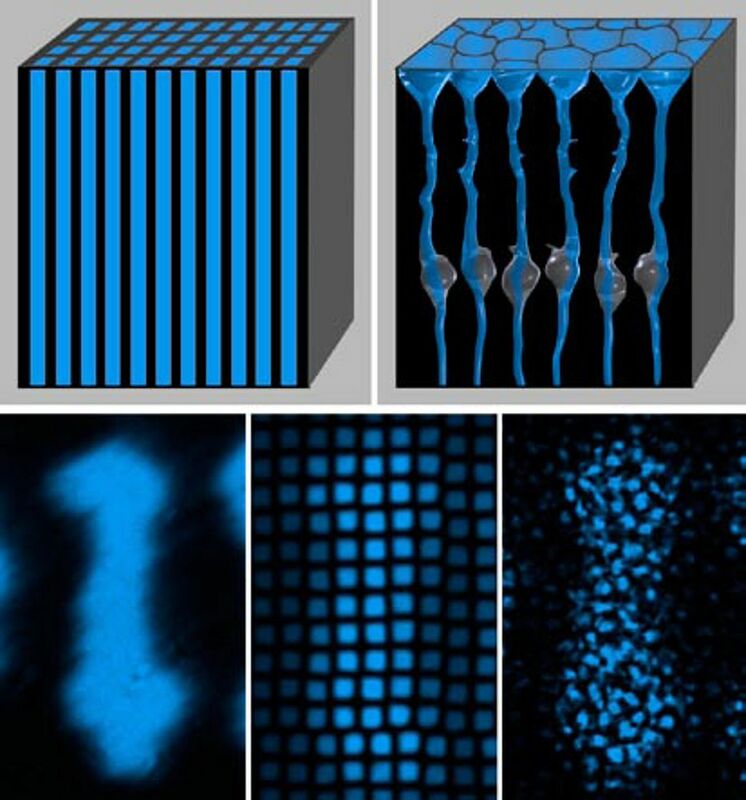 Thus, Müller cells not only allow low-loss light transfer through the scattering inner retinal layers to the photoreceptor cells but also optimize the coupling of the retina to the transparent media of the eye. On the one hand, resolution is therefore limited to the density of Müller cells (with each being connected to one cone photoreceptor cell) and is out of question as image transfer mechanism in the foveal region with higher cone density. However, on the other hand the improvement achieved by the light guiding mechanism obviously stood the test of time for most vertebrates. Consequently, nature not only created the problem of the inverted retina 530 million years ago but also provided for its solution: it simply used Müller glial cells as living optical fibers. Franze K, Grosche J, Skatchkov SN, Schinkinger S, Foja C, Schild D, Uckermann O, Travis K, Reichenbach A, Guck J. (2007) Muller cells are living optical fibers in the vertebrate retina. Proc Natl Acad Sci U S A. 104(20):8287-8292.